“Hangover” is the term used to describe the group of symptoms that occur after having drunk too much alcohol. In most cases, the more alcohol a person drinks, the more likely they are to suffer from a hangover once the effects of alcohol have worn off. 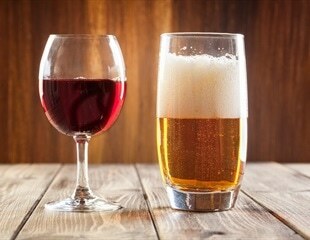 Despite popular belief, drinking beer before wine does not reduce the severity of veisalgia, otherwise known as a hangover, the following day. In a trial of one of the main class of prescription sleeping pills, half the participants slept through a fire alarm as loud as someone vacuuming next to their bed. But a newer alternative preserves the ability to wake in response to danger signals, according to a new research. As New Year's Eve approaches, many people will experience the familiar buzz that comes from imbibing a favorite cocktail or glass of wine. In a European Journal of Neurology study of 2,197 patients who experience migraines, alcoholic beverages were reported as a trigger by 35.6 percent of participants. Parents may plan for transportation and childcare ahead of holiday gatherings but are they prepared for a potential, day-after "parenting hangover?" Driving under the influence of alcohol may not be a good idea because one is not in control. A new study has shown that that driving with a hangover is also not a good idea. The effects of a heavy drinking session on our thoughts and performance may last longer we think, according to a new study. Alcohol hangovers are more significant and costly than people realize, new research shows. Although individuals may be "street legal" to drive a car, or go to work and operate machinery, they can be just as impaired with a hangover as if they were over the alcohol limit. A new study conducted by a group of researchers at MRC Laboratory of Molecular Biology, Cambridge revealed the significant role of alcohol in causing damage to DNA in stem cells and thereby increasing cancer risks. The study was funded by Cancer Research UK and the results were published in Nature. Scientists have shown how alcohol damages DNA in stem cells, helping to explain why drinking increases your risk of cancer, according to research part-funded by Cancer Research UK and published in Nature today (Wednesday). Most New Year's resolutions fail. A study, from the United Kingdom's Royal Society of Public Health, found that that "quitting smoking is the most difficult resolution to keep. Professor David Nutt, previously chairman of the United Kingdom’s Advisory Council on the Misuse of Drugs and now teaching at Imperial College, believes that having a hangover after a an episode of binge drinking would soon be a thing of the past. A new synthetic alcohol called “alcosynth” could provide the pleasures of alcohol consumption without the harmful side effects. With the end of the year approaching, it is the season of festivities. From work parties to friends and family gatherings, all of these celebrations can lead to increased opportunities to drink alcohol, which can make it easy to overindulge. A United European Gastroenterology (UEG) report published on July 4, 2017 reveals details of alcoholic consumption in all 28 states of the European Union, with an average of 2 alcoholic drinks being consumed per day by EU citizens. People with a family history of alcoholism are already known to be at a greater risk of developing a drinking problem, but new research led by Psychologist Dr Richard Stephens at Keele University has found they are also more likely to hold onto the painful memory of hangovers. Emotional experiences can induce physiological and internal brain states that persist for long periods of time after the emotional events have ended, a team of New York University scientists has found. Summer is preparing to make its debut in a few weeks, and along with it, most of us will flock to the outdoors to soak up sunshine and Vitamin D.
Boost your mood and energy levels this Blue Monday (18 January) by topping up your vitamin B12, say natural health pioneers BetterYou. It's almost New Year's Eve, and many will be ringing in 2016 with champagne, wine, beer and cocktails. But for those who overindulge, the next day is accompanied by another tradition: the New Year's Day hangover. Ferrer, a privately-held Spanish pharmaceutical company, today announces the first patient has been recruited into a phase IIa clinical trial to test the efficacy, safety and tolerability profile of Lorediplon in adult patients with insomnia disorder. The study is scheduled to be completed by Q4, 2016.